I was very happy to but 2 of these for $180. If anyone has these I would strongly suggest switching out the spigots on them. I've had about 5 batches infected now. Three of them my Kolsch attempts for garrison comp. I soak these in oxy-clean free in hot water for a couple hrs each brew and then in sanitizer. It looks like the piece of pipe is either rusted or has some sort of build up. It honestly seems rusted as I can't even scrape it off. It's possible this is actually chrome since I've seen the exact thing on some of the chrome tail pieces I have on my taps. Here's my solution for just capping it off. Just a plug and some washers from everwood. I'll dismantle these and soak in oxy each brew. Still happy with the purchase just wish I had sense enough to throw these spigots away back a few months ago when I became worried about them. I'm brewing my Kolsch again today and gonna try to push it out before the submission date but I know i don't have enough time. I purchased one of these a year ago and love it. I never use the tap on it, and I was trying to figure out a way to plug it. Can you include the list of items? I know the hole isn’t round, so am I going to have to cut/round it out? Hmmmm...those spigots look like the taps on the Mangrove Jack fermentors...I've encountered some crud on those, disassembled them, and scraped it off, soaked and boiled it in in PBW and Diversol. My thought was to replace them with two piece stainless valves...I have three on the fermentors and one on the sparge heater (somewhat different) I'm not worried about the sparge heater as it's only used for hot water but certainly concerned about the other three. Bowserm wrote: I purchased one of these a year ago and love it. I never use the tap on it, and I was trying to figure out a way to plug it. Can you include the list of items? I know the hole isn’t round, so am I going to have to cut/round it out? This will pass through a SS washer and gasket on the inside. On the outside there's a locking washer that the 1/2 NPT end of the plug threads into, there's a special sized gasket that goes into the recessed area of that washer. All easy to find at Everwood. I did have to grind out the sides of the hole on the side of the tank since it's an oval shape rather than round which prevented the old spigot from turning I believe. I had to be careful because I used the side of a drill bill to do this and I was afraid if bit dug in too much it would have caused one of the washers to leak. 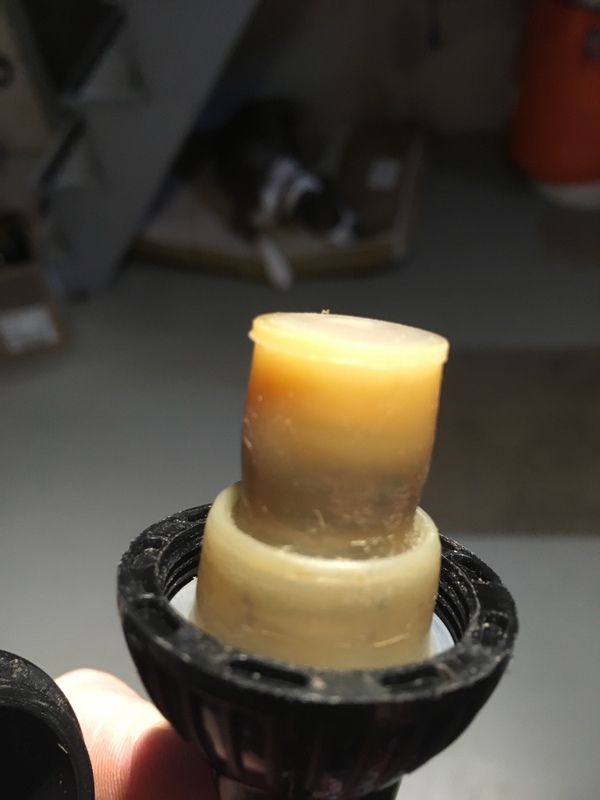 I teflon taped the thread part of the plug I don't know if it's needed and I'll have to replace it every time I ferment because I would imagine critters could get at the first few threads on the inside. You sure that's not their Sparge water heater they are selling? They were using the one I bought to ferment in and sold them all off about a year ago. They still sell new ones. They have a plastic bottom with three 90deg feet on them that the plastic screw into. There's no element. elreplica wrote: Hmmmm...those spigots look like the taps on the Mangrove Jack fermentors...I've encountered some crud on those, disassembled them, and scraped it off, soaked and boiled it in in PBW and Diversol. My thought was to replace them with two piece stainless valves...I have three on the fermentors and one on the sparge heater (somewhat different) I'm not worried about the sparge heater as it's only used for hot water but certainly concerned about the other three. I was looking at replacing these with a valve instead of a plug. It's a better idea to use the valve since you could clean and sanitize that to our standards and then use it for pressurized transfers/zero o2 transfers. I like the idea of that for IPA's and such. I also hate autosiphons, you can clean them but it's almost impossible to avoid those little scratches you get in them. So a SS 3 piece valve would really complete these things and perform just as well as some expense SS fermentors. So my tragic story with these is that I had a Westvleteren 12 clone aging for 8 months, I used this just for a bottling bucket. 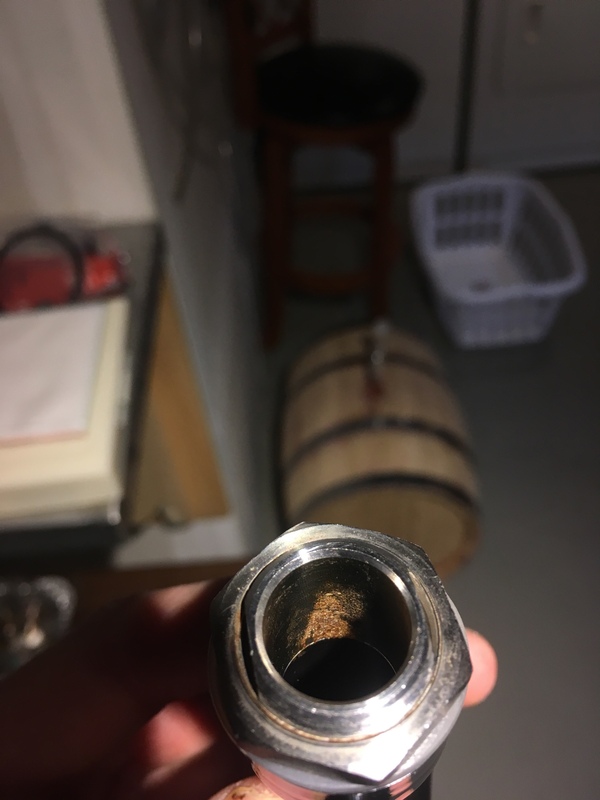 It's possible that the beer was contaminated prior to bottling or it was just the tubing I used coming out of the spigot but every bottle is contaminated with a pellicle in every single one. The beer came out of aging as one of the best beers I've ever tasted and now tastes terrible. I'm going with a stainless steel valve on the other one I own when I get my saison out of it. I'm plating that one for contamination half for practice half to see how bad the spigots are. Well... just kegged another infected beer. It tastes pretty damn delicious though. Yeah, too bad about the infection. I just finished a lager in one (Marzen) and a Pils awhile back with zero issues. I really don't like the look of those spigots when I clean them though - hence my thought about replacing them with a stainless valve. They're stainless Mangrove Jacks fermentors- same company as Grainfather.ive used one as a sparge heater but never burned the arse out of it lol - as I used a heatstick...it worked well enough but I decided to get the GF sparge heater. I ended up just plugging my second tank since I already had the parts for it. This time I put the lock washer with the gasket inside the tank and it is definitely more sanitary that way. I will still need to disassemble it each time. The the configuration with the lock washer on the outside left spaces on the inside between the head of the plug and the SS washer just where the plug head is hex. A small washer would be better but everwood didn't have any. Regardless, dismantling and a good soak in oxy/pbw would do the trick. One of my plugs had a very very slow drip, ended up plugging itself thankfully. Thinking about doing the three piece SS valve on my two soon. I wanna be able to take samples aseptically to monitor my brews a little better.